Bright colors, beautiful costume and a cute little pet, not much to complain about here. 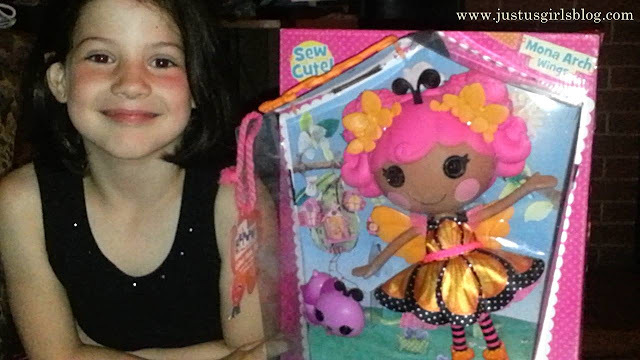 These dolls are so cute and very loved! We have a little collection going on and my little girl was so excited to add the Mona Arch Wings doll to it. These Lalaloopsy dolls were once rag-dolls that magically came to life and took on the personalities of the fabric used to make them. 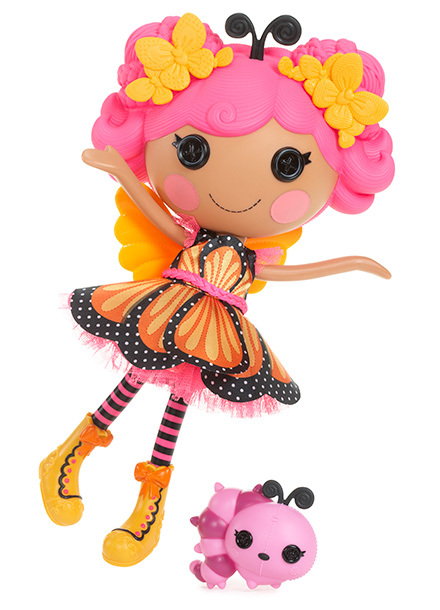 With a new season comes new characters including the Lalaloopsy social butterfly, Mona Arch Wings. The Mona Arch Wings doll is a pretty good size (13 inches) that comes with a beautiful outfit and shoes that can be removed for play along with her pet caterpillar. One of the things I loved about this doll was that her wings weren't detachable. This way they never get lost and she can remain a beautiful doll with her wings at all times. My little girl has so much fun with these dolls. Her name started a conversation and had Joey looking up Monarch Butterflies, which I thought was pretty awesome. These dolls are very well made and durable. My youngest daughter at a year old plays with Joey too. I watch her closely since there are some smaller accessories but both girls are drawn to the bright happy colors and all around adorableness. The Lalaloopsy Mona Arch Wings retails at $29.99 and can be found at Toys “R” Us, Walmart, Loblaws and Sears. Disclosure: All opinions are my own. I received a Lalaloopsy Doll at no cost for the purpose of this review. No other compensation was received.